Evernote iPad Mini App - Keyboard Hides Bottom of Note - Help? I'm having an issue with using the Evernote app on my iPad Mini. When typing towards the bottom of a note, the text lines that I am trying to type on become hidden by the keyboard. I try to scroll the note up, but once I get so far down in a note there is nothing I can do to be able to see the last line of text being typed while typing. I have to hide the keyboard, look at where my text is being typed, bring my keyboard back up, and hope that as I am typing I am making no errors since the keyboard overlaps my text. Is this a bug that needs to be fixed, or is it something I am doing? As a work around you can undock the keyboard by holding the keyboard symbol (bottom right of keyboard). I did try typing in both the zoom and full screem mode, and I have the same issue with both. I do see the function to hide the keyboard, but that only helps me to see where I am placing my text. Once I click to start typing my keyboard pops up and it hides any text on the lower portion of the note that I am trying to work on or add to. It may be just a glitch with the iPad. This is a screen shot showing how the lower text is covered by the keyboard, even when zoomed in. I'll hope for a software update that fixes this! Oh I see.. could be because you are using the split keyboard mode. Frankly split keyboard and bluetooth keyboard have multiple issues, its not something they appear to have tested much. It is the same with full keyboard, unfortunately. Looks like you have the note zoomed as well in that screenshot. I use an iPad 3 when you start to edit if often doesn't show the cursor properly but as soon as you press the first letter it moves and keeps the cursor visible by scrolling the note as appropriate. I've tried it both zoomed and not zoomed, the problem still occurs. I've tried starting to type as well, but it does not bring the text up into view. Instead, it types hidden under the keyboard and I have to hope it is correct. I'm wondering if it is maybe because of the smaller screen on the iPad Mini vs. a full sized iPad. @vor Welcome to the forums. Thanks for confirming the problem isn't isolated. I'm having the same problem. iPad mini iOS 6.1.3. 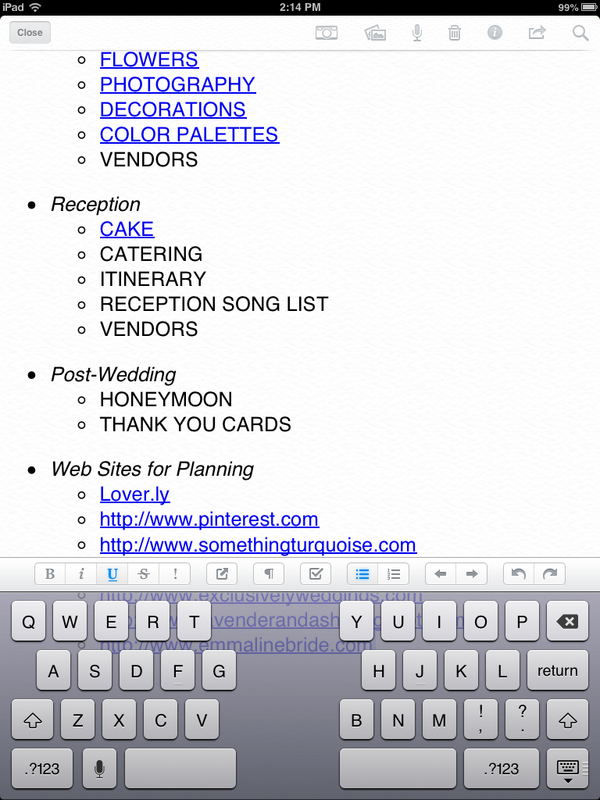 Using Evernote 5.4.3. Tried to do a hard restart of the ipad, did not work. Delete the app and reinstall. Same problem. I cannot write a note that is longer than one page. I just upgraded my account and find this very disappointing to NOT be able to see my text while typing and editing is impossible. A true ***** shoot. EN is a good company and I cannot imagine that this isn't going to be fixed VERY QUICKLY. PLEASE DON'T DISAPPOINT. I have tried all that the others tried and NO GO. I'm having the same problem -- but not only in evernote. It seems to be a system wide ipad mini bug, that can happened to me in other text editors or writing programs as well. My Workaround: go to the end of the document and hit "return" a number of times to create an empty space at the button. Then scroll upwards to where you want to edit. My guess is that you won't see a fix anytime soon. Evernote will almost certainly wait for iOS7 to make any major updates to the app, and at the earliest, we won't see iOS 7 for another week or two. Even then, there is a beta testing process to go through, so I'd recommend following 42birken's advice. I'm using regular IPad and having the same exact problem. Really wish Evernote would fix this. Can't really type if the keyboard is blocking the text. Update: I apologize, this seems to be not an issue if I merge the keyboard (instead of splitting it). I have the same problem with my Ipad (not mini). Same problem Sept.2014, although it just started for me. Have latest updates on iPad. Seems like it's a setting that was changed, but I don't have any idea how to undo. My son has same iPad, no problem! I'm having this issue as well on my full sized iPad, but only when I use my Bluetooth keyboard with the iOS virtual keyboard minimized. I can fix the issue by leaving the iOS virtual keyboard on the screen, but I would rather use the app full screen. Hi. This is killing my use of Evernote, which will be sad as I have come to rely on it quite a lot and I now have to use my iPad a lot more. Is thee a fix or not?! Same problem here. I get the bottom of the note in view and as soon as I type it automatically scrolls down so I can't see what I'm typing. I've noticed that this thread goes back to 2013 and it's shocking to think that an app for note writing has a bug which makes it almost impossible to write a note, and it still hasn't been addressed. Does not solve for me. THIS IS A HUGE BUG! I've already moved some stuff to Google Docs. This doesn't seem to be an iPad/iOS bug, since I'm typing this on this forum with no keyboard problem whatsoever. This seems to be an old problem, but I fell into it late in 2016, so I started reading the messages on this topic and Firianto had the solution to the problem. As soon as I stopped splitting the keyboard on my iPad my documents started scrolling when they got to the bottom of the page. Oh, what a relief it is! I'm glad to see this is not an isolated issue for me. I am experiencing it currently with an iPad Air 2 running latest versions of iOS and Evernote. The virtual keyboard (not split) covers the bottom of the note, where I am typing. I am unable to see what I am typing, which makes it almost impossible to use. In 2019 this is still a very annoying issue. Running latest version on 10.5 iPad Pro. Hey if the developers need some user testing to help, sign me up.